Perhaps a personal example would be useful. During our move to Colorado this summer, I pretty much stopped my spiritual practice. It felt awful but it also felt impossible to start again. Finally, through tiny steps and kind self-talk (e.g., sit on cushion: okay honey, that’s good for today), and a dash of grace, I found myself back in the mediation room regularly! Whoa! A few weeks ago I was a loser because I wasn’t meditating at all, now I’m a loser because I’m enjoying meditations my teacher recorded. Excuse me? Greatness – which I define as dedication, steadfast application, devotion; you can define as you like – cannot be built on a foundation of nothing, and that is what you get if you never rest in what you are doing, if you never savor what is here now: nothing. You want to be a better writer, parent, business person? Start by savoring what you are doing. Bill Stafford wrote so many poems. Being in action leads to more action. Deciding you can’t reach the top of that building leads to sitting on the sidewalk and crying. Bill Stafford wrote so many poems. Quantity is a fantastic way to improve. 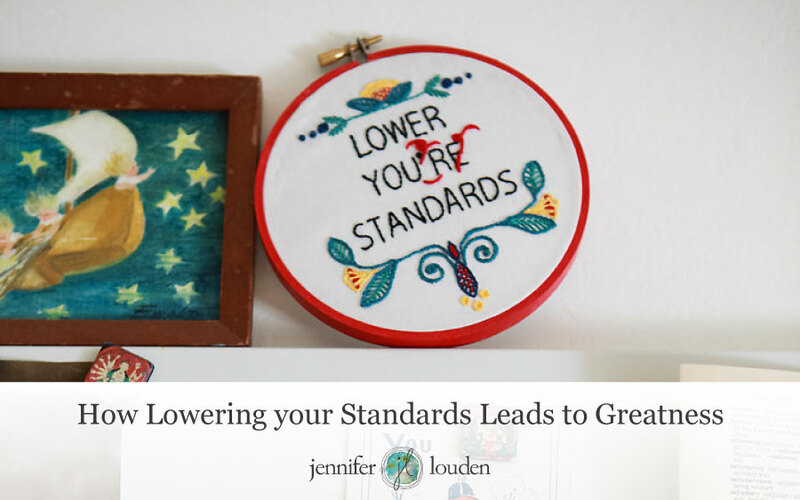 Lowering your standards and savoring what you did gives you a place to grow from. I am here; I want to be there. What do I need to learn next? To effectively learn, you need to practice the things that stretch you, confound you, frustrate you. But it’s difficult to practice what is frustrating if you don’t have a foundation of self-trust and the ability to see what you can do now. You will be too unmotivated, think there is no point in stretching yourself toward greatness, and possibly have no idea what you need to practice because you don’t know what you can do now. Go ahead, pick one area of your creative life and lower your standards for taking action. What would allow you to be in consistent action? How will you savor and celebrate? May you find this a way to unlock even more of your astounding greatness.